Retiring Senior Sergeant Greg Trew with a framed present from Shoreline Marine Fabrication of new patrol boats. 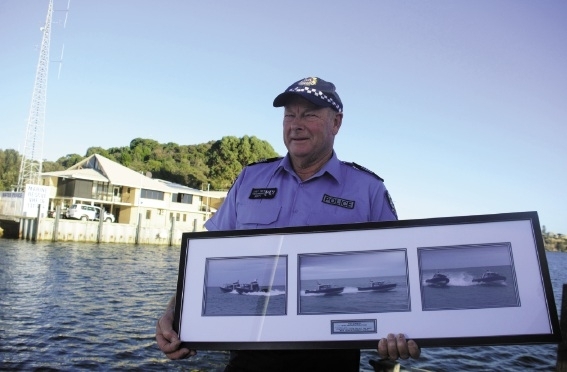 RETIRING Water Police Senior Sergeant Greg Trew wants state government departments to bring together their sea rescue capabilities after he retires from 33 years with WA Police this week. “The future challenge is to align government resources and services, including those in the departments of Transport, DFES, Fisheries and Parks and Wildlife, so they co-ordinate, and then together reduce costs and improve services,” Sgt Trew (63) said. 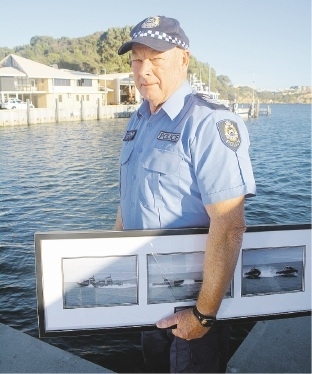 A life member and former president of City of Perth Surf Lifesaving Club, Sgt Trew got Department of Transport (DoT) staff to man communications at Water Police’s North Fremantle headquarters, saving police wages and putting DoT in contact with its patrol boats’ work. “Boats now carry EPIRBS and it’s mandatory all around the coast, so when one is set off we now know there’s a problem,” Sgt Trew said. After joining as a 27-year-old in 1979, he had long periods in the forensic, surveillance and security management sections of WA Police. “I applied for Water Police when I saw a position, and I was always involved with the water and had a basic boat coxswain’s ticket,” he said. Tragedy is a sad part of the job. “A couple of years ago, a couple travelling around Australia drowned at Coral Bay, leaving their two orphaned kids on the beach, and dealing with that, when there are kids standing on a beach while the rest of the family is spread around Australia, is a tough gig,” Sgt Trew said. “We once had a report of someone breaking onto a boat, and promptly boarded it, only to find an amorous couple ‘otherwise engaged’, who hadn’t told the owner they were going to use his boat in Mosman Bay,” Sgt Trew said. Married with four adult children, his immediate plans are to “go to Indo for a surf with some geriatric mates”, and a kite-surfing safari to Sumbawa.